We had spent the day ambling along the lanes and generally enjoying the sunshine. Later that day, and it was time to put on some lights, refuel both cars and drivers and plan the following day. It was at this point that life got far too interesting; one of the 'Sevens' started to fill up with smoke, as hot insulation dripped out from between the coils on the armoured covering of it’s cabling. A quick disconnection of the battery and a selective hotwiring allowed it to be driven back to base. Battery isolators are a “must have”! In daylight, the extent of the damage could be seen. 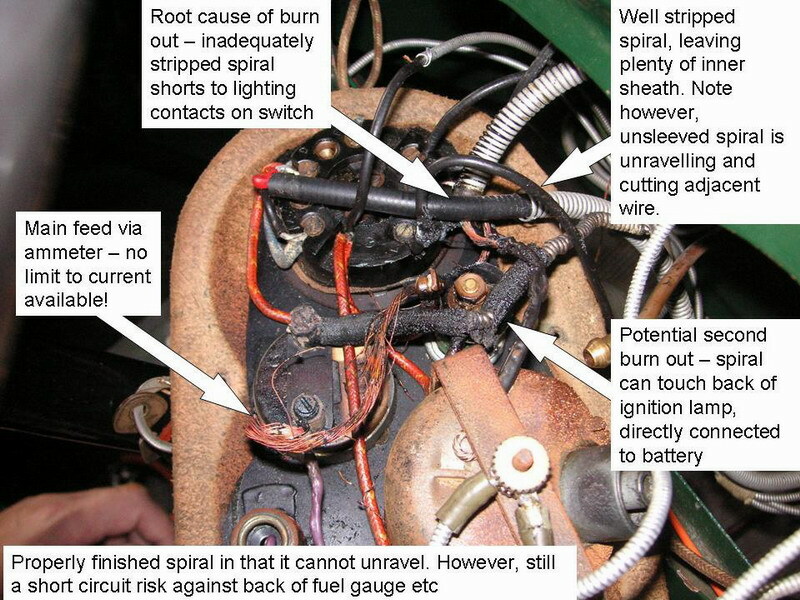 The main wire from the starter motor to the ammeter was molten, the wire from the ammeter to the main switch completely frazzled and serious damage had occurred to the feed to the rear lights. This proved to be the root cause of the problem. All of the car’s wiring had been installed using armoured cabling. At the light switch, the wire for the taillights had had very little armouring stripped back, and none of the inner sheathing was left to protect the insulation. The razor sharp aluminium had cut through to the light feed, and being earthed had short circuited the lighting circuit to earth. The outer armouring is an aluminium strip, which leaves very sharp edges when cut back. It is essential that the armouring is covered at the cut end either with a rubber sleeve or better still, some heat shrink sleeving. This also prevents it from unravelling. The inner sheathing protects the individual wires from the aluminium. This sheath should always be left slightly longer than the armouring so that it cannot cut through the insulation of the individual wires. Well, if you wish to use this type of cable, then fine. However, I would identify some fixed part of the car, such as inside the dash near the hole for the wires to the cut out, there the armoured cable should be terminated. It needs to be anchored down with P clips or a saddle clamp so that it can’t flap about. Here, sleeve each cut end with heat-shrink sleeving after joining it to a short length of the correct colour coded wire. If you want to put an in-line connector to make removing the dash panel easier, then this is the obvious place. Under the bonnet, inside the headlight shells etc again ensure that the spiral is secured and bound so that it can’t touch a connection and can’t come unravelled – especially if near something prone to vibration, such as the dynamo. This article, written by Geoff Hardman, originally appeared in CA7C Seven Focus in Nov 2006 pp14-15.